The Syracuse University Center for Sustainable Community Solutions, in partnership with the Puerto Rico Recycling Partnership Organics Team is pleased to host the first-ever Puerto Rico Organics Summit. The objective of this event is to gather stakeholders across sectors to discuss how composting practices benefit the economy and the environment of Puerto Rico. Topics to be explored include: Regulation for the Design & Operation of Municipal Composting Installations, Composting as part of comprehensive Disaster Debris Management, and Community Outreach. Facilitated discussion will be focused on strengthening and expanding composting operations in Puerto Rico including, but not limited to, public policy initiatives and PRRP Organics Team projects. Description: "From plastic-packaged food in the kitchen to toothbrushes and shampoo in the bathroom; from the carpet on the floor to the clothes in our closets, our world is full of plastic! Although some plastics make our lives better, much of it is a problem—polluting our oceans and beaches and harming our health with toxic chemicals. Join us for inspiring stories and practical tips about how each one of us can reduce plastic. Author Beth Terry and policy specialist Genevieve Abedon will share their journeys and explain why we can’t just recycle our way out of this mess." Description: Dr. Jenna Jambeck will be talking about her research on global waste management and mismanagement of plastics. This webinar is intended for a general audience. From April 17 through 23, 2017, DDR shopping centers across the Island will offer talks about diverse environmental issues and recycling. There will also be electronics recycling stations. For more information visit DDR's webpage. With the support of US Environmental Protection Agency, the Puerto Rico Recycling Partnership (PRRP) is collaborating with the Virgin Islands Recycling Partnership (VIRP), the PR Solid Waste Authority, and the US Department of Agriculture to host the first Caribbean Recycling Summit. With this event, we hope to offer an opportunity to connect the public, private, and non-profit sectors of the Caribbean, with the goal of carrying out concrete actions that will lead to sustainable materials management in our islands. The event will provide an exhibiting opportunity for companies, organizations, and agencies, as well as a venue for themed workshops related to challenges, opportunities, and new advances in the recycling industry. The Five Star and Urban Waters Restoration Program is looking for proposals for projects focused on water restoration, especially in neighborhoods with high concentrations of minorities and low income population. For more information click here. If you have questions regarding the application process there will be a webinar on November 15, 2016, on how to do the applying process. Click here to register. Sign up for a webinar on the access rates and development of recycling collection programs. For more information click here. Sign up for a webinar on reforming laws and policies to enhance food recovery at the state and local level. For more information click here. Local Foods, Local Places will be receiving applications until November 6, 2016. Local Foods, Local Places helps people create walkable, healthy, economically vibrant neighborhoods through the development of local food systems. Local Foods, Local Places aims to boost economic opportunities for local farmers and businesses, improve access to healthy local food, and promote childhood wellness. Click here for more information. Attention Students and General Public! The International Compost Awareness Week is holding a contest to look for this years' poster. Categories range from elementary school to adults. For more information click here. Register now for the fifth annual Campus RainWorks Challenge prize competition! This challenge asks student teams to design innovative green infrastructure for their campus. This year teams will incorporate climate resiliency and consider community engagement in their green infrastructure designs for stormwater management. Registration for this year’s competition will be open from September 1-30, 2016. For more information click here. Currently, over 30% of the food currently grown and processed in the U.S. goes uneaten. When wholesome, edible food ends up in a landfill, all those embedded resources (along with the money spent on them) also get wasted. This impacts the environment, our community and the bottom line. The Food: Too Good to Waste toolkit was designed and developed for local governments and other community partners to help prevent wasted food in households. This community food waste prevention toolkit has been tested throughout the US and helps households save money while reducing wasted food by up to 50%. During this webinar we will present results from an evaluation report on several campaign implementations and hear from three of those communities who successfully implemented this toolkit. For more information, visit the link here. SWANA is looking for students with an interest in designing solutions for solid waste management problemas. Click here for more information. On August 30, there will be a webinar on planning and managing natural resources in coastal areas. For more information click here. With hashtag #puntacucharasreverdece and under the proposal Reverdece tu Comunidad (Advise Council for Urban Forestation and Communities of Puerto Rico) of the University of Puerto Rico, in Ponce, a community activity is scheduled to impact the Punta Cucharas Reserve. The date of the cleaning will be Saturday, July 23, 2016, starting at 9:30 am through 2:00 pm. This activity includes cleaning and recycling (material characterization) of the solid waste accumulated along the coast, monitoring the Water Quality (with a kit provided by the Program of the Estuary of the San Juan Bay), a mini-tour through the mangrove forest, lagoon, secondary forest and coast, and finalizes with a gathering of the groups and community organizations that will participate. There will also be certificates for contact hours. To view the press release (in Spanish) click here. For more information (in Spanish) click here. Join the party while you help the environment volunteering in the recycling efforts at the Vieques Carnival. Fill the form here. Join the challenge of creating a sand sculpture to create awareness in the people about the importance of taking away waste when visiting the beach. There are two categories: individual or teams of 3 participants. Don't lose this oppportunity to create art and awareness with Basura Cero PR, this Sunday, June 26, 2016 in Carolina's Beach. Spaces will be limited. Sign up here. The Department of Agriculture will be offering a series of workshops geared towards integrating the conservation of resources and the environment with agriculture. SWANA will be offering a MOLO certification course. The sessions will be in Spanish with didactic material provided in English. Those interested should register before Friday, March 25, 2016. Get the registration form here. The corresponding payment for the course should be made before April 8, 2016. For more information click here. EPA will offer a one day conference on integrated pest management that will also include information about the Zika virus and handling of the Aedes Aegypti mosquito. The conference will be free and simultaneus translation will be avalaible. ​To view the agenda click here. To read the details and access the agenda, click here. EPA is seeking proposals from state entities (agencias, universities, etc) and indian tribes, for projects that deal with greenhouse gases, reduction of hazardous materials in municipalities, government and communities, and practices for pollution prevention in food manufacture and processing. For more información, click here. March 10, 2016, 9:00am-12:00. Meeting in Fort Buchannan to form alliance and collaborations with non-profits. You can read more details on this opportunity by clicking here. Read more here. Attention Juana Díaz, Villalba and nearby towns. RCAP Solutions Inc. invites you to a meeting organize Lake Guayabal's cleaning and restoring efforts. The Environmental Quality Board of Puerto Rico has just published the announcement of public hearings on the regulation of composting in which the PRRP has been working and pushing for the last 1-2 years or more. Cruz A. Matos 1375 Ponce de Leon Ave., Urb. San Jose Industrial Park, San Juan, Puerto Rico. To read the official public hearing announcement click here. Big step for recycling organic in Puerto Rico! You can read the Regulation (in Spanish) here. This next Sunday, November 15, Organic Cooperative Madre Tierra will celebrate Recycling Day. This celebration will take part along the traditional agro-ecological market that takes place in Placita Roosevelt, in Hato Rey, the first and third days each month. 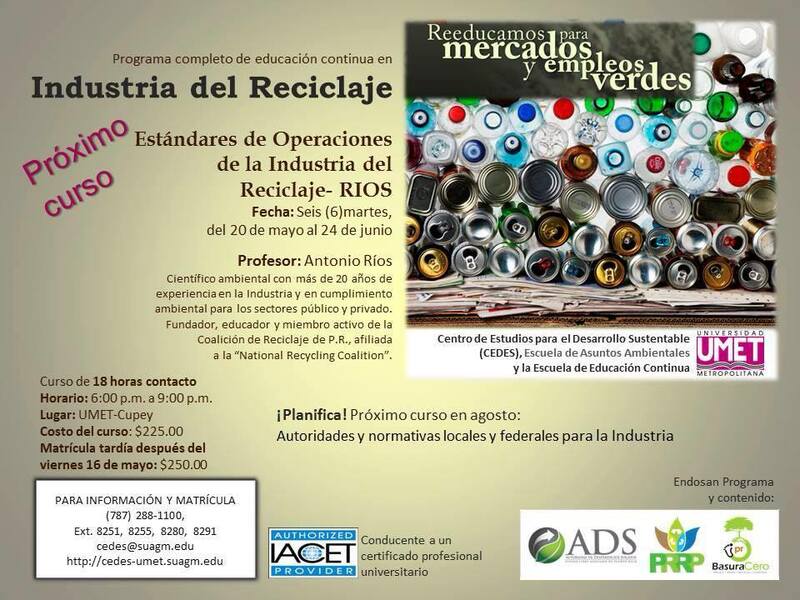 There will be informative lectures about recycling and the Cooperative will present the goals achieved using their innovative system to recycle all residues, including the organic products sold in the market. Everyone is invited to buy fresh and agro-ecological products from the work of young farmers in the oldest agricultural market on the Island. There will be music. Entrance is free. In this webinar, experts from the glass collection, processing and manufacturing industries will address the facts behind the hysteria and explain why glass recycling—when done according to a few proven best practices—is more viable, more efficient and more important than ever. For more information click here. The Reflect and Take Action Movement of Vega Baja, invites volunteers to join the social network Facebook and register for the event "Costa reflects the 2nd Cleaning and works for your beach Vega Baja" or simply present day cleaning. As security measures, it is important to bring closed shoes, sunscreen, and consider to be well hydrated throughout the event. Location: Visitor's Center for the Cantera Peninsula. PRRP members are also invited to attend to learn and get involved in activities related to the program of Trash Free Waters initiative happening in Puerto Rico that will take place in conjunction with this meeting. After the meeting, there will be a guided expedition by boat for those interested in learning more about the Estuary. RSVPs are required. Please RSVP as soon as possible to Grisell Diaz-Cotto at diaz-cotto.grisell@epa.gov. *More detailed information regarding the meeting will be sent out in the following days. Time: 9: 30am - 5:00 pm. Southern Botanical Garden, Rio Piedras, Puerto Rico. Map available here. PRRP members are also invited to attend to learn and get involved in activities related to the program of Trash Free Waters initiatives happening in Puerto Rico meeting. You can now register for the new courses of UMET's Center for Sustainable Development Studies (CEDES). This semester offers courses about the recycling industry, ecological and cultural tourism and urban agriculture and agro-ecology. You can read more details here. Experts in the recycled paper and plastic industries will provide an update focusing on the domestic and global recovered paper and plastics markets. We extend this invitation to participate in this interesting event taking place next Wednesday, February 4th 2015. Due to limited spaces, please register beforehand for the event using the following link. Were: Building Luis A. Ferré Piso 3, Sala de Audiencias #6. To view a copy of the legislation project #2141 click here. Stay tuned for meetings and activities related to recycling refund legislation. Note: The development of container recycling legislation is a key objective of the PRRP Integrated Solid Waste Management Strategy available here. Time: Thursday, November 13, 2014. On October 30, 2014 EPA Region 2 held a summit in New York City. This meeting's initial purpose was to better involve various organizations in launching Trash Free Waters. The SU EFC facilitated the meeting through establishing themes and goals of the project. Click here to learn more about the event. A public meeting and press conference was held regarding a Law for Container Recycling (commonly referred to as a "Bottle Bill"). Legislators Víctor Vasallo and José Baéz had a press conference to present this Bill, which will be submitted to the floor during the next Legislative session. The Bill is being endorsed and co-authored by Representative Javier Aponte Dalmau and President of the Lower House (Legislature), Hon. Jaime Perelló. The events will take place at the at the Capitol building, House of Representatives, María Luisa Arcelay Room at 11:00am. The development of recycling refund legislation is a key strategy of the Puerto Rico Recycling Partnership Integrated Solid Waste Management Strategy. Both PRRP members and the public are invited and encouraged to participate. To view a copy of this legislation, click here. Time: Tuesday, September 9, 2014. For reading the meeting minutes click here. Field trip: "Keep Calm and Recycle"
For meeting minutes, reports and additional information on past events click here.